Late last year, news broke that E&M Associates and Eiran Gazit were planning to build a 49,000-square-foot Times Square tourist attraction in part of the 12-story former New York Times Building, an individual landmark at 229 West 43rd Street and 216 West 44th Street (the north building is not landmarked), in Midtown. Now, the team has filed plans with the Department of Buildings for the project, dubbed Gulliver’s Gate, The Real Deal reports. The ground floor portion will include the reception and ticketing areas, as well as a gift shop, while the second will host the main exhibit. The project is expected to begin the city’s Uniform Land Use Review Procedure (ULURP) shortly. It also requites exterior alterations to the 43rd Street side, which will need to be approved by the Landmarks Preservation Commission. Last November, the team signed a 15-year lease for part of the ground floor and the entire second floor of the building. Kushner Companies acquired the retail portion of the property, which also contains office space, in early 2015 for $296 million. If all goes as planned, completion can be expected in 2017. Stanley Wong’s SP WONG Architect is the architect of record. 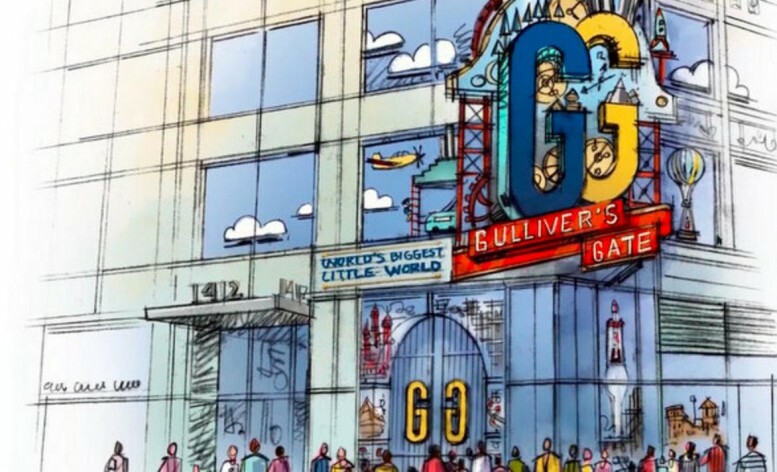 2 Comments on "Plans for ‘Gulliver’s Gate’ Tourist Attraction Move Forward at 216 West 44th Street, Times Square"
Exactly result of the plan and work, hold an advance on way of entertainment. Maybe NYC should consider renaming Times Square, Disneyland New York!